Need more room? Full restaurant buy outs are also available. For more information, please contact us at 919-205-2500, or events@gonzatacosytequila.com. Our outdoor patio is the perfect location for large groups and parties all year long. Get an outdoor experience with a fountain view. It can accommodate 50 standing and 40 seated guests. Our high top Chef's Table is located in a nice secluded area for any semi-private event. You can enjoy an interactive party style dining experience. Our Chef's Table can accommodate groups up to 14. Enjoy a semi-private experience in our bar area. It is the perfect place for a cocktail party or informal reception. It can accommodate 40 people standing. All beverages including wine, spirits, beer, and sodas are charged on a consumption basis and are in addition to the per-person menu price. Beverage Packages can also be made to better suit your event. Our Event Coordinator is happy to help you decide on a beverage package. Please click here to make a reservation online. 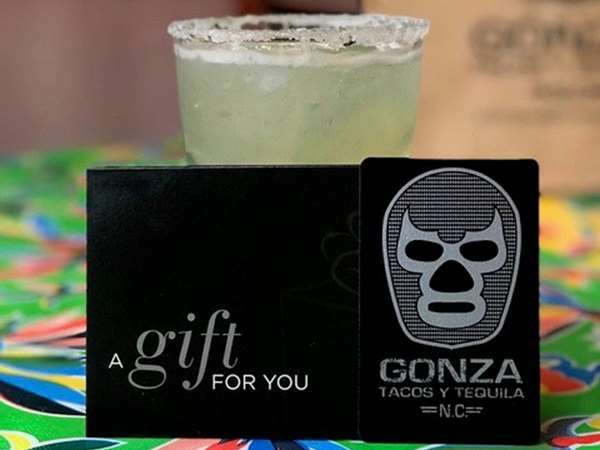 For parties of 15 or more please contact our Event Coordinator at 804-539-1299, or events@gonzatacosytequila.com. All parties of 8 or more will be issued 1 check with 20% gratuity. The guaranteed attendance for your event is due 48 hours prior to the event. If your actual guest count is less than the number guaranteed, you will be charged for the guaranteed number of attendees. We require a deposit of 50% of the contracted food and beverage minimum in order to reserve the space for the event. The deposit will be deducted from your final bill upon the conclusion of your event. Events cancelled less than 72 hours prior to the event date may forfeit all deposits made. All events are subject to a 20% Service Charge, Service Fee and the NC County Sales Tax. We accept corporate checks, MasterCard, Visa, American Express, Discover, cashier’s check/money order and cash. Regrettably, we cannot accept personal checks. We do allow for outside pastry and cakes to be brought in house with no additional charge.